Go to the instrument booking calendar. For help locating the booking calendar please see the guide Navigating to the instrument booking calendar. If you have permission to book (or request to book) yourself (or others) for a machine/method, it will appear in the "resources" view table with a green calendar button to the left of the machine/method name. Click this to open the booking page. Fill in the booking request form. Include a title for your booking which will appear on the booking calendar for all users. Select the time of your booking (if applicable) by clicking in the box and selecting a date and time using the calendar or manually enter a time and date in the format DD-MM-YY hh:mm (note the timezone given for bookings is currently fixed to be Europe/London). Enter the duration of your booking (if applicable) in the format DD-MM-YYYY hh:mm. Select the user you are booking the machine/method for (if applicable) e.g. yourself if it is you who will be using the machine/method, or a colleague if it is them who will be using the machine/method. Fill in any other form fields required by the booking request form. Click "Submit Request" to book the machine/method at the selected time (subject to machine/method booking configuration and machine/method availability). 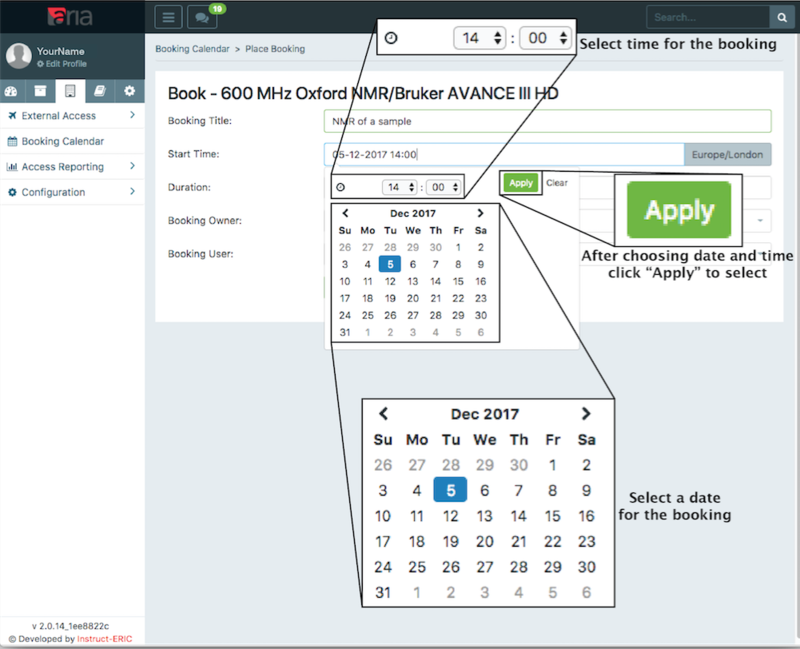 A message will appear saying "Your booking request has been placed successfully", and the booking you have made will appear in the booking calendar at the specified time. For information on how to make changes to the booking placed, see the guide Editing a booking; and for information on how to delete the booking placed, see the guide Cancelling a booking. The machine is already booked for the time you have requested and only allows one user at a time. You have exceeded a facility-set quota for the maximum number/length of bookings in a time period. The machine has an outage during the time you have requested. The booking is outside of working hours and your permissions are set to only allow bookings within working hours.